Football Stadium is located behind the M.T. Anderson Support Center. 85 South to White Horse Rd. exit. Right off Exit. First Right (Frontage Road) follow Frontage Road past Thomas Kerns Elementary and Southside High School. Left on Connector Link. M.T. Anderson is straight ahead. Take I-85 North from Greer. When you get into the Spartanburg Area, take the Pine Street exit & head into town. You will pass the Milliken complex on the left after you exit 85. Go all the way through town and keep on trucking! This road becomes simply Highway 176 and goes straight into Union. It's a good easy road to drive. Basicly, the turn off I-85 is the only one you'll make until you get to the parking lot! When you get to Union, you'll see a Hardee's on your right. Go through two traffic lights & Union County Stadium is ahead on the left. There is a Wal-Mart, etc. almost across the street. There are several places to eat in Union, and of course in Spartanburg on the way. It should take you about an hour, to an hour & fifteen minutes to get there, depending on your pace & traffic. They have a really nice facility with good parking as well. Their fans are great football fans, are very polite, and they love their team. Let's take a great crowd & show them how much we love OUR Yellow Jackets!! Click the link below for directions to BHP. I have gone this way when I went to Erskine College to referee, and it is a good route. However, it is a "secluded" route, once you turn off of 25. Last time we went this way, then came back the other way. Not much to stop & eat til you get back to Greenville anyway! Driing directions from Hwy 14 in Greer to BHP.....down US 25. You can go down 85 and merge left on US 29 (exit 34)and go 7.6 miles. Turn left on Cheddar Rd for 2.9 miles, thenit becomes Copeland Rd for 1/2 mile, then Garren for .3 mile, then continue on US 178 E/US 76 E/s Main St for 5.8 miles and BHP is on the left. EITHER WAY- WE HOPE TO SEE YOU THERE! 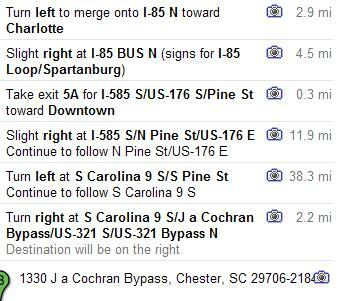 If you get on at US-29 in Spartanburg, you will go about 70 miles, but either way you will exit at EXIT 91. Take EXIT 91 and turn right on Columbia Avenue. Chapin High is 300 Columbia Ave and it will be 1.3 miles on your LEFT. From Greer to other venues, fill in the Mapquest form. First, take I-26 to Columbia. Then take the I-20 East exit towards Florence. Take exit 73B onto I-77 North. Follow I-77 North approximately 4.5 miles. Take exit 24 onto US-21 (Wilson Boulevard) toward Blythewood. Blythewood High School is approximately 1.5 miles ahead on the left. 1-Follow I-26 until you get on I-126 all the way into Columbia. 2-Where I-126 ends, take the Elmwood Exit. Go to second stoplight. Turn right at the McDonald's onto Assembly Street. Travel approximately two (2) miles and you will be facing the Fairgrounds and see the stadium just ahead.